Keilly McQuail in Strictly Dishonorable. Photo by Leah Faye Caddigan. 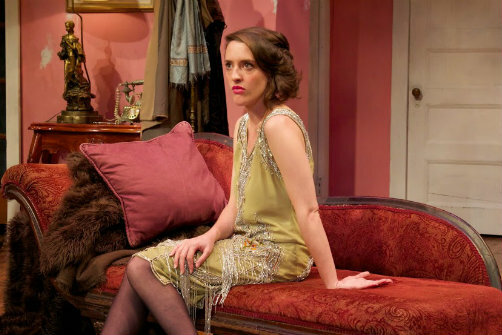 BOTTOM LINE: This revival of a comedy from 1929 is charming and funny, with bits of social criticism on the era's double standards towards women. In the 1920s the role of women in society went through many significant changes with gaining the right to vote, and a new counter culture image for young women emerged through the flappers who embraced a new way of life. The play Strictly Dishonorable, which premiered on Broadway in 1929, sought to explore the changing role of women by focusing on a female main character who challenges her impending marriage to a man she doesn’t love and questions the meaning of being sexually honorable and “pure.” Attic Theater Company decided to revive this Broadway classic and give us a glimpse into the old New York City. The play opens in a speakeasy in Hell’s Kitchen were a duo of Italian waiters squabble in Italian over playing an Italian opera on the radio. The owner of the speakeasy, Tomaso (Christopher Tocco), screams at both of them in their shared native tongue as he walks to find his place behind the bar. Judge Dempsey (John Robert Tillotson) who lives above the speakeasy, strolls in and is cajoled by Tomaso to have one old fashioned before bed (which quickly turns into several). Tomaso presents a letter from the court over a traffic violation and the Judge calmly puts the letter in his pocket, saying he will take care of it. Clearly the staff and regulars at this speakeasy have become a sort of family to each other, looking out for one another. When New Jersey couple Isabelle (Keilly McQuail) and Henry (Thomas Christopher Matthews) stumble into this hidden bar, Isabelle is quickly smitten with what she perceives to be its New York glamour whereas Henry wants to leave immediately. Isabelle coaxes him into staying but he becomes increasingly rude to the waitstaff. While the staff is irked by Henry, they are charmed by Isabelle and become increasingly flirtatious. A resident of the building, a lothario named Gus (Michael Labbadia), becomes transfixed by her and she is impressed when she learns he is both a model for Lucky Strike cigarettes and a well-known opera singer. While Henry is out checking on his car Gus coaxes Isabelle into dancing with him and the two display an overt attraction for one another. When Henry returns he is irate to learn that Isabelle danced with another man and he falls onto the floor in a drunken rage, letting loose a flurry of ethnic slurs against Italians. Horrified by his behavior, Isabelle chooses to stay in the speakeasy, turning her back on her safe future with Henry. Gus asks Isabelle to stay in his place for the night, claiming she can sleep on the sofa, but both of them know what he really is after. When asked what his intentions are, Gus replies that they are, “strictly dishonorable.” While Isabelle has her hesitations, she remains interested, pulled in by a sexual attraction she never felt for Henry. She even naively tells the Judge that she is in love with Gus. Within the comical situations and repartee that unfold here, Sturges has embedded some commentary on challenging the role of women in society and the sexual double standard (which was obviously much worse in 1929). In one scene the Judge tells Isabelle that he knows she will not sleep with Gus because she is a good girl, and that he can always spot good girls. Isabelle wryly tells the Judge that perhaps good girls are only good because they have not yet found the right person, since it usually takes two people to be bad. When Henry later inquires about whether Isabelle’s virginity is still intact she asks him, “How about you? Are you still pure?” Henry tells her that it’s not the same for men, and when she pushes for an explanation he just angrily insists that it just is. Pointing out this double standard was probably quite progressive for 1929, and it still has some relevancy today. While the ending of Strictly Dishonorable winds up being a conservative one that somewhat bends to the sexual morals of the era, the play most likely was far ahead of its time. Aside from social commentary, the production also gives us a glimpse into an older New York, where the residents still spoke in Irish and Italian accents and were tied to the politics of their home country. Keilly Mcquail is immensely charming as the gutsy but naïve Isabelle, and pulls off her character’s fast paced comedic banter. Christopher Tocco seems to be especially skilled at maximizing the comedic potential of each of his lines and adds much to some of the play's more madcap moments. The cast also seems to have a great deal of chemistry together, enabling them to pull off the timing and physical comedy needed for each scene as they easily play off one another. The scenic design by Liz Sherrier and the costumes by Travis Chinick also give the play a feeling of authenticity that seems to accurately reflect the past. While much of the comedy here may be froth, the show remains highly entertaining from start to finish.